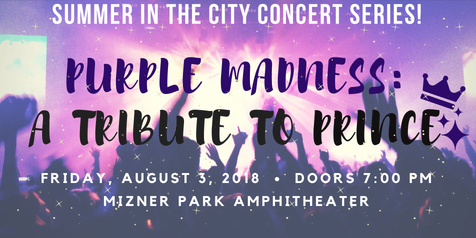 This Friday, August 3, 2018, the City of Boca Raton will host the next free tribute concert in the 'Summer In The City' concert series line-up with a live musical production of “Purple Madness: A Tribute To Prince.” This family-friendly event is free and open to the public, with doors opening at 7:00 pm and the concert beginning at 8:00 pm. The free concert will kick off with a special performance by musical guests TCHAA (pronounced CHA), sponsored by the Funky Biscuit. TCHAA is a popular local South Florida band with an entirely unique sound which can be described as a funky blend of Jazz and Hip Hop that is sure to get the crowd movin’. Following TCHAA, Purple Madness will hit the stage with an unforgettable tribute performance to Prince, one of the most beloved artists and influential entertainers of all time. Widely known as America’s #1 Prince Tribute Band, Purple Madness will bring to life some of Prince’s most memorable concert moments with a high energy, electrifying, “must see” performance. Purple Madness leading front man & world-class Prince tribute artist, Bobby Miller, along with some of the most talented dancers and musicians touring the U.S. and abroad, have all but perfected every last nuance in recreating the sights and sounds of the artist Prince, promising a mind-blowing show which the group proudly describes as second to none. In addition to the live musical performances, the event will also feature plenty of fun and games, as well as food and beverages available for purchase inside the venue. Mizner Park Amphitheater is located at 590 Plaza Real in Downtown Boca Raton, FL. Event attendees are encouraged to walk, bike, or ride-share to the event or to arrive early for the limited free parking which will be available at City Hall and the Boca Raton Library. Attendees may bring blankets or chairs for seating, however, chairs will also be available to rent for $5.00 at the event which will take place RAIN or SHINE. With first-class live entertainment, incredible music, fun games, and awesome food & drinks, the upcoming 'Summer in the City' concert series event at Mizner Park Amphitheater is the perfect, family-friendly way to spend a South Florida Summer Friday night! As always, we at Champagne & Parisi Real Estate look forward to seeing you there! Please visit the Mizner Park Amphitheater website for additional venue info and answers to Frequently Asked Questions. Click here for the full line-up for the City of Boca Raton’s “Summer in the City” concert series.